Both owners, Pia from Austria, and Sudath from Sri Lanka welcome you heartily to their villa. They have built the green parrot-villa, finished in August 2014, with plenty of passion and observing high European standards. They will be happy to help you in every way, such as organizing tours and giving all necessary tips and advices. Sudath, owner and manager Is available at any time. He looks after the well being of the guests will fulfill their daily individual wishes . He is supported by a friendly team of four, responsible for cooking, cleaning, and washing. Nothing is too much trouble! A delicious breakfast awaits you each morning which is included in the price. On request, lunch and dinner may be prepared for our guests in the villa, using good regional products. – Optionally, meals can be ordered by a home delivery service nearby. TukTuk trips can be booked at any time. We also offer tours and airport transfers with our own air-conditioned mini-bus. The driver speaks English Various massages can be organized by us during your stay at our villa..
Outside: large private swimming 11 x 4 m, garden furniture, seat set and lying beds in a beautiful garden where our guests can relax in the shade and look out onto the lovely secluded sandy beach Utility Room: private phone, high speed internet, cd player Cleaning / Towels / Linen / Maid service: A friendly team of four, responsible for cooking, cleaning, and washing. A delicious breakfast awaits you each morning which is included in the price. On request, lunch and dinner may be prepared for our guests in the villa, using good regional products. This villa is amazing and the location to die for right on the beach and very good value for money.Sudarth the manager owner went out of his way to make sure we were well looked after.The property is beautifully designed and very clean with two delightful housekeepers Eeme and Gita who couldnt do enough for us.They served a delicous breakfast and can also cook an evening meal for you at reasonable rates and everything was delicous.We ate at the villa every night except one.There is also an onsite security guard overnight. I had been in touch with Sudarth since July 2018 and he had very kindly arranged a driver for us for our onward travels around the Island again at a very reasonable rate.He also arranges day tours from the Villa with a detailed price list available and also masseurs that come to the villa as there is a spare room next door for this purpose.We all had massages and they were very professional. The villa is fantastic value for money and we will definitely be returning for a longer stay. This was one if the best experiences I have had on holiday. Everything well organised and Sudath made us welcome and had everything in hand. The villa is great and relaxing, definitely well worth visiting for an extremely enjoyable stay. 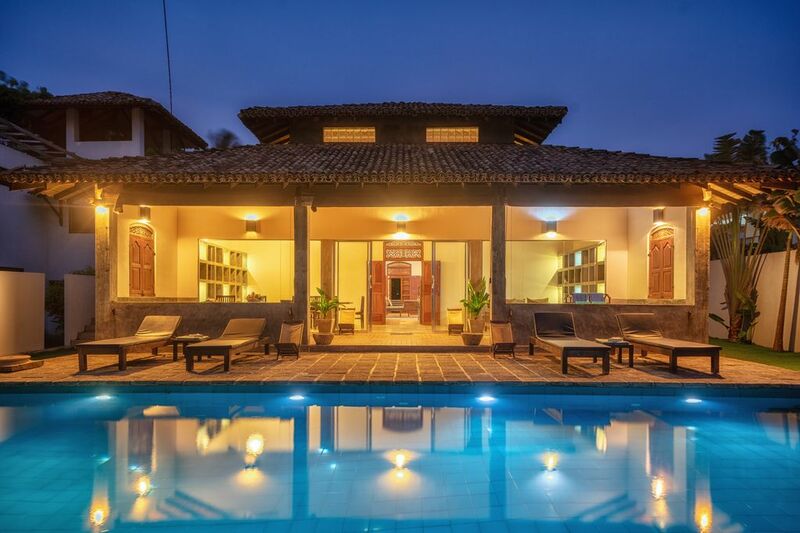 A modern boutique style villa combines Western standards of comfort with the charm of the locality. Very special to mention is the incomparably loving, friendly service by the always smiling charming service staff. Authentic cuisine, where we could join and learn how to cook. The ocean is within 50 steps with a almost private beautiful sandy beach. Typically noises coming from the street now and then, but really not disturbing. Actually, these sounds, as well as the singing of the birds that visit the pool to drink water, add to the Sri Lanka feeling. Everything was well organised from the first day when we were picked up from the airport by the driver, Sudath came every day asking about our needs, organised day trips, which were perfect, singhalese breakfast in the morning and when we stayed singhalese dinner fresh cooked by the house staff. Many thanks to all those who have looked after us so attentively during our stay. It was a wonderful vacation and we are already planning the next stay. Green Parrot jolie villa sur la plage. Nous avons passé 10 jours très reposants à la villa Green Parrot, certainement la plus jolie de la plage. Elle est confortable et décorée avec gout. Nous avons été accueilli par Sudath qui peut faire les arrangements que vous souhaitez. Les gentilles Geetha et Irisha préparent de bons petits déjeunés et s'occupent du ménage, Sushil lui entretient le beau jardin et la piscine et est présent le soir pour garder la villa. Nous avons pris le tuk tuk tous les soirs pour diner à Hikkaduwa où nous avons apprécié quelques bons petits restaurants animés et les petites boutiques. N'oublions pas les adorables écureuils palmistes qui mettent de l'ambiance dans le jardin et qui nous ont bien amusés. Nous remercions toute l'équipe ainsi que Pia et Sudath pour avoir pu profiter de leur jolie villa. just a few of steps to the sandy beach. On request and – at any time – we shall gladly pick you up at the airport. Ambalangoda is famous for their carved masks ( see museum) and dancers. In the neighborhood you can find interesting temples, moonstone mines, turtle farms and boot trips on the lagoon. and Brief-Garden. Round Tours – also those lasting several days – can be organized individually, such as to the Unesco World Cultural Heritage places, nationalparks, tea plantations, temples, botanic gardens, elephant orphange, waterfalls, rope bridges and so forth. These tours can be arranged with our air-conditioned mini bus and our english peaking driver or another bus operator. has a well sorted wine store, restaurants and an active night life. The Unesco cultural heritage of Galle Fort is about 30 km away and definitely worth a visit.